How Much Do You Listen To Epica? We are under construction, but you are free to join us on the wait for 2012, the year of Epica! Favorite Epica song : All of them! 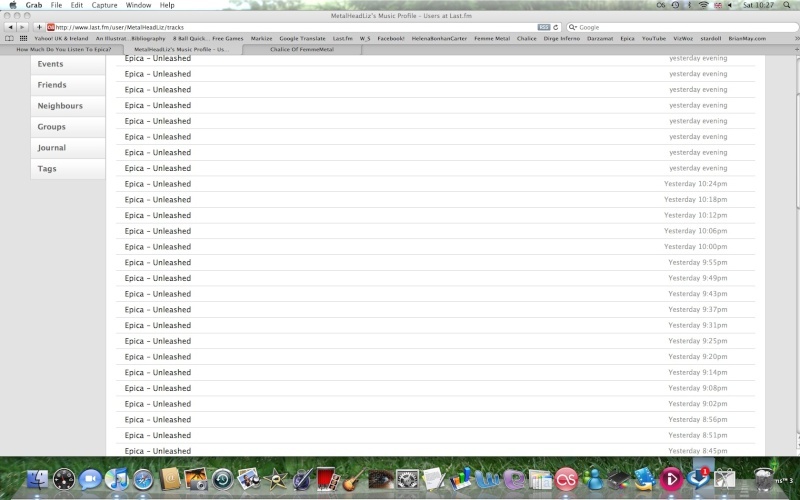 Liz could you send Unleashed mp3 to my email? Epica are the most played artist on my Last.fm with 432 plays ATM. 30.09.2010 - Thank you Epica for giving me the best time of my life! Oh, is there a legal mp3 of Unleashed floating around? I have looked, but I can't seem to find one! If anyone knows where I can download it, please let me know! the only legal mp3's of unleashed will be those released on 16 october 2009 at any internet recordshop. Yeah the one now is ripped from the video, don't see it as illegal either though. 1642 atm...probably that + 20-30 for everyday that has passed since this post. I listen everyday to Epica. I'm obsessed, I think. I know! It isn't a tribute to Delain, many people think that... April rain sounds for me like a melody, I don't know... It sounds lovely. Favorite Epica song : Tides Of Time, Solitary Ground, Our Destiny, This Is The Time. I listen to Epica every day, not always a lot, but today I've listened to about 7-8 songs so far, and it's guaranteed to reach at least 20 songs! Subject: Re: How Much Do You Listen To Epica?